The charging system on Beach House is coming along and is a major improvement from what we started with. It is also a bit unconventional for a boat charging system. After many years of installing these systems on my own and other boats I am always looking for a better and simpler way. The trend on boats today is to move away from simple into the complex as manufacturers try to integrate more systems and get single pieces of equipment to do more. The results have been more breakdowns and fewer repairs that can be done by owners. More capabilities and information are at your fingertips, but at a cost. In the last year, I have heard more and more reports about the Iota battery chargers and their use on boats. These units are not just chargers but converters as well. 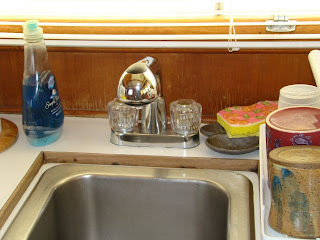 This means that the 12 volt system on the boat can be run off these units even if a battery were not connected. Not all marine battery chargers can do this and some can be damaged trying. The units convert the 120 volt AC to 13.6 volts nominal DC. The units are called "smart chargers" because they will deliver maximum current for whatever period of time needed to replace the charge but not stress the batteries. It will cut back to virtually milliamps once full charging has been achieved while still maintaining the proper voltage and will maintain that voltage under whatever demands are placed on it. The units are completely silent and do not run hot like many other chargers. They also use what Iota calls Tight Line Regulation which insures that the output voltage stays steady from no load to full load. This will keeps onboard pumps, lights, and motors operating at the correct voltage and thereby increasing their life. An equalization charge on the batteries on a regular basis goes a long way to prolonging the batteries life. The Iota will sense if an equalization charge has not been done for a week and will equalize without overcharging and gassing the water out of the batteries. The teak master continues making the exterior wood look beautiful as systems continue on the to-do list. The teak work seems never ending and overwhelming sometimes, but with each section that gets done the boat looks better and better. 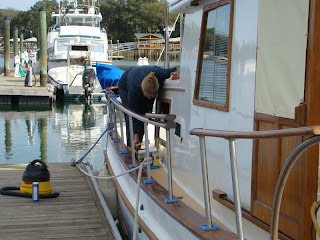 We tried to convince ourselves that when we bought the next boat after our sailboat was sold that we would buy one with no teak on the outside. 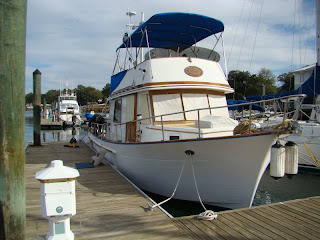 So what we did was buy one with even more teak than the sailboat had and not in very good shape. The weather this time of year also slows the process and we are expecting a couple of days of rain so the going will be slow. In addition to the refinishing, we have to be careful to not leave holes from the hardware for the rain to leak in. But since we have been doing this for many years we have it down to a science. The holes from the hardware are caulked to keep water out but not so that the hardware can't be re-bedded when it goes back on. With the Sikkens Cetol we use there is no need to sand between each coat, which helps a lot, and the coat that went on in the morning is dry enough by afternoon so that if it rains, it won't hurt the finish. The usual approach is three coats of the base, we now use the "natural teak" coating, and three coats of the gloss. With the new natural color, it does not change the color of the teak and give it that brown or orange coloring as the older bases did. Once the gloss goes on, it is difficult to tell from the usual types of varnish. After these six coats, all that is needed is a yearly maintenance coat afterwards. That is why we switched from traditional varnish several years ago.